When your restaurant's sinks get clogged or you have other restaurant drain problems, then instead of dirty water, you have money going down the drain. Having to fix a leaking restaurant garbage disposal takes time and resources that could be better spent taking care of customers. The Drain Strainer™ is a solution for all types of service sinks that prevents the need for restaurant drain maintenance, additional commercial garbage disposal parts, snaking clogged drain lines and the need to keep restaurant drain cleaning equipment around. Our commercial sink drainer solution prevents commercial restaurant garbage disposal and sink problems before they start. Blocked drains in your commercial kitchen bring everything to a halt. Sinks won't empty. Dishes can't get washed. When water backs up instead of going down the pipes, you've got a problem that requires immediate attention. These are major signs you need to consider an alternative drain cleaning and straining solution. Using other drain cleaning equipment and products to attempt to unclog drains isn't the best solution. Drain chemicals only offer limited effectiveness, require ongoing expenditures with repeated use and can damage your plumbing system over time. Using an auger or industrial snake for unclogging drains is a dirty job to tackle yourself. Paying someone else to do it is expensive and will only solve your problems temporarily. Hiring a plumber to water jet your sewer line requires even more of an investment and it still doesn't get to the root of your drain cleaning and commercial draining problems. Instead of wasting time and money on restaurant floor drain clog repair, The Drain Strainer™ prevents them from becoming blocked in the first place. 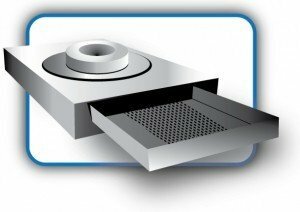 Our drain straining solution is a food solid separator that allows the water from your sinks to filter through its strainer drawer, while capturing all the solids that would normally clog your pipes. See our "What It Is" page for a full description of how our drain straining solution works. Other drain screen or straining systems go inside your sinks. While these prevent solids from going down the pipes, unfortunately they also keep your commercial sinks from draining very effectively. Employees eventually get frustrated and bypass those types of systems. This leads right back to the original problems that cost your business time and money to solve all over again. The Drain Strainer™ lets your sinks drain faster and keeps food particles out of your pipes. Visit our "How To Install A Drain Strainer™" page to see our video of an actual installation that eliminated problems with clogged floor drains in a school cafeteria. Stop spending money unclogging drains the old fashioned way and start preventing these problems with The Drain Strainer™. Visit our "How To Order" page to get your professional drain straining solution today.